The Blue Mountains are a section of the Great Dividing Range in Australia, about 50km to the west of Sydney. The name comes from the blue mist which is emitted by the millions of eucalyptus trees in the area. The Blue Mountains consists mainly of a sandstone plateau with a maximum altitude of 1190m. Over time the plateau was eroded by rivers and streams which caused the formation of a large number of gorges and canyons. A large number of different species of eucalyptus trees as well as other flora grow in the area. The Blue Mountains are a popular tourist destination and have been a UNESCO World Heritage site since 2000. 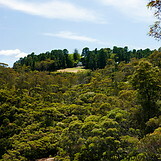 Seven national parks and a conservation area are located in the Blue Mountains. The Three Sisters are three adjacent rock pillars which can be observed from Echo Point, a panorama viewpoint near Leura, a small city in the area with many cafes and antique stores.